In a show of callous disregard towards the lives of homeless people, city council voted yesterday to reject the proposals made by the Community Development and Recreation Committee (CDRC) on November 20 that included the immediate opening of the federal armouries and the addition of at least 1000 new shelter beds. With a few notable exceptions, most councillors cast their support behind the counter-proposal announced by Mayor John Tory this past Sunday. In doing so, they made decisions that will leave most homeless people in crisis, do little to alleviate overcrowding in shelters, and, in all likelihood, continue the horrifying trend of 8 homeless people dying every month. The proposals championed by Tory are the result of a series of compromises brokered by Councillor Joe Mihevc with an administration that is opposed to dedicating the level of resources the situation demands. However, in his sorry attempts to gain favour with a conservative Mayor, Mihevc not only voted against his own prior motion to add a thousand beds but also sabotaged an attempt by Councillor Kristyn Wong-Tam to open the armouries. This last move was particularly troubling because it came following an announcement by the federal government that it is prepared to negotiate the use of the armouries as a temporary homeless shelter, should the City request it. Wong-Tam’s motion to get the City to put in that request gained support, but ultimately failed 17-25, with Mihevc and the Mayor voting against. The motions that passed closely echoed the announcement made by the Mayor over the weekend. They call on City staff to assess the possibility of opening up to 400 spaces across existing shelters, motel rooms and a drop-in centre. Furthermore, they asks City staff to attempt to open 3 shelters, originally scheduled to open in 2019, sometime next year. 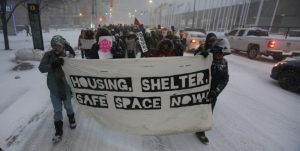 Unlike the armouries, which have the infrastructure to provide shelter beds to hundreds of people, and could be opened within a matter of days, the proposals that passed do not guarantee the expansion of beds in the coming weeks, or even months. 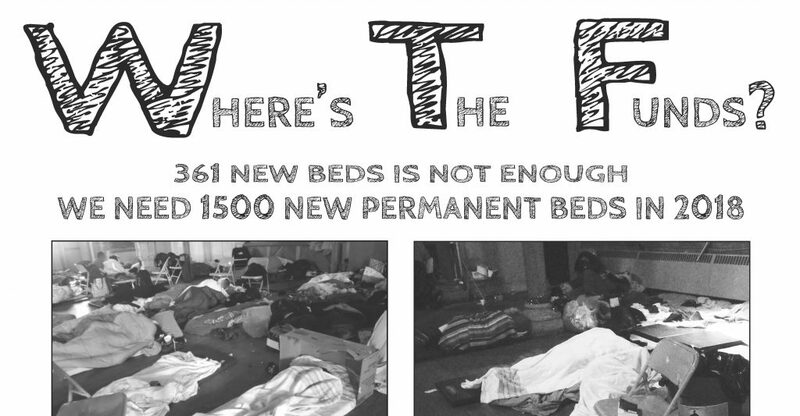 The City is relying on cramming beds in already overcrowded existing shelters. Most shelters have already been through this process before and are already packed. Further crowding, if even possible, will dramatically increase the risk of infectious diseases, infestations and violence. The City also plans to rely on more motel beds which may benefit homeless families but won’t help single people – who form the largest section of the homeless population. Lastly, the City’s proposed new drop-in space, even if opened relatively quickly, would not provide beds or adequate washroom facilities. This means the majority of the homeless will remain in a situation very similar to the one they are in now – forced to either sleep rough or crowd into survival spaces like the drop-ins which are not equipped to serve as shelters. 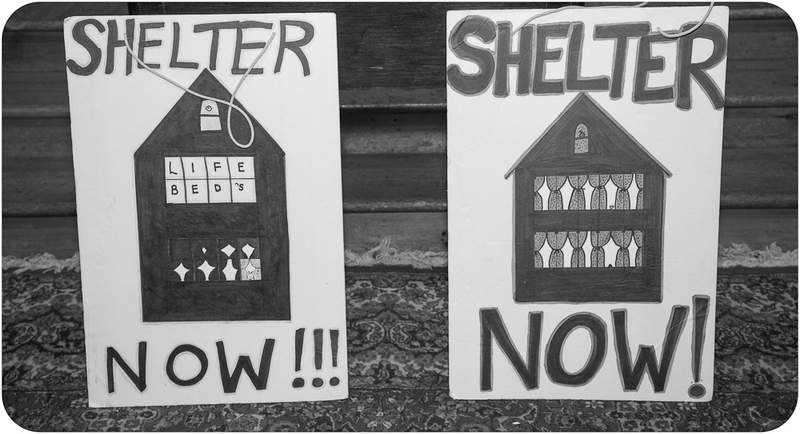 These proposals will not prevent harm this winter or make a substantive impact on the current shelter crisis. While any addition of permanent beds in the current situation marks an improvement, unless a certain threshold is crossed, the crisis will persist. That threshold today is the addition of at least 1000 beds which will bring the system closer to guaranteeing a spot for everyone in need. The proposal that passed yesterday promises to add an estimated 300 new beds over the next year. That would be better than nothing, but it will not satisfy the need, and still leave hundreds with nowhere to go. Another point worth addressing is the careless scapegoating of refugees that characterized debate at Council yesterday. The Mayor and a number of councillors blamed refugees’ use of shelters for the pressures on the system. They cited the fact that refugee shelter use has gone up 15% over the past year. While the increase in shelter use is undeniable, the conclusion is utterly unjustified. The current shelter crisis is a product of the worsening housing crisis, low social assistance rates, declining incomes, and the ongoing failure of council to address the shortage of shelter spaces. Shelter use has increased dramatically across all sectors since 2015. The percentage of refugees in the shelter system is comparable to years past. Their numbers were simply artificially low under the Harper regime because of its regressive immigration policies. Blaming refugees for a crisis that all three levels of government are responsible for creating is reprehensible, can only increase xenophobic violence, and must be viscerally opposed. Yesterday was also the National Day of Remembrance and Action on Violence Against Women. 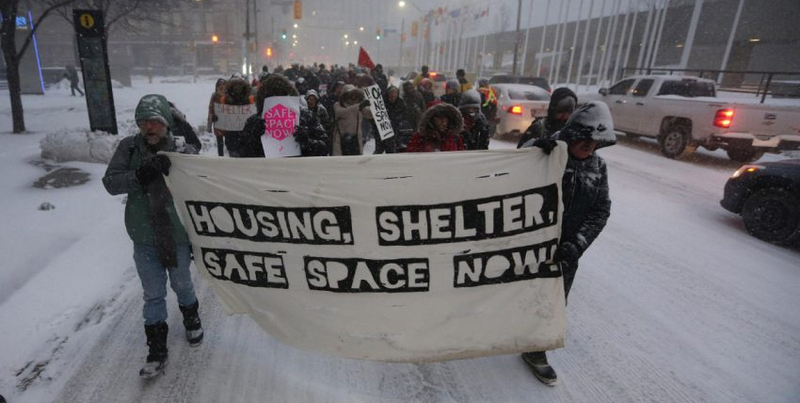 Homeless women and trans people in Toronto continue to deal with a situation where shelters serving them are full every single night, jeopardizing the lives and safety of the many who are left without a bed. Decisions council made yesterday will not result in any immediate change in that situation. What transpired at council yesterday was perhaps not unexpected, but made a few things clear. No longer can the City claim that the shelter system is not in trouble. The Mayor and Council are clearly willing to tolerate high levels of human suffering, but the ongoing resistance by homeless people and allies has forced a response. The problem is that the response is a grossly inadequate one and people’s lives are on the line. So let it be clear to the Mayor and his lackeys that this fight will escalate and that we intend to win the measures that are necessary, including the rapid opening of the armouries.